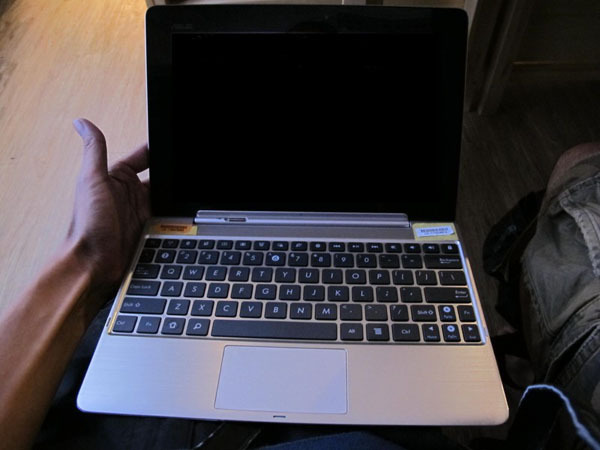 That’s how the Transformer Prime will look like with its laptop dock on. Now, we don’t have any further information as to whether the dock is made of aluminum or not, but it looks gorgeous. I’ll admit it looks MacBook-ish, but nevertheless, it is a nice piece of kit. On to the tablet itself, its back panel too looks as if it’s made of aluminum, but until we hear from ASUS on the Prime’s announcement date, we can’t be 100% sure. As you may recall from a recent interview with ASUS Chairman Jonney Shih, the tablet will rock the quad-core Nvidia Kal-El platform with 1GB of RAM and a 10.1-inch IPS display. Pretty juicy stuff. Here are the rest of the Transformer Prime’s live photos.